1. Niobe (D): "The Hills"
3. Michaela Melián (D): "Kloster"
4. Masha Qrella (D): "Everything Shows"
5. Gladys Garcia (D): "Iron And"
6. Designer Imposter (USA): "Good News"
7. Morgenstern & Lippok (D): "Please Wake Me Up For Meals"
8. Mike Grant feat. Sky (USA): "A Beautiful Thing"
9. Dj Genesis (USA): "Loose Control"
10. The Student Body Presents (USA): "The Rush Hour"
12. O1O (USA): "2 Dollar Bill"
13. Miss Marjorie (USA): "Invisible"
14. Barbara Lahr (D): "Last Goodbye"
Followed by the last year's successful compilation 'FemaleFuture', we like to present to you, in cooperation with the labels Moving and Rubaiyat, the next chapter of the Uppercut- series on Phazzadelic. This tracklisting is far more dedicated to the producing female artists than the first FemaleFutures. Especially on account of this, the compilation is silhouetted against the numerous "best of female singers..."-compilations that came up in the meantime. 'FemaleFuture Transatlantic' almost just represents atrists who compose, write lyrics, play instruments, and produce tracks on their own. "As I recently wanted to go and see an auspicious electronic music festival, I hardly couldn't believe my eyes whilst scanning the programme. Where were the female artists? On the festival's website: pictures of men. Followed by even more pictures of men. Were all females passed over? Yes, and weren't even invited to this event at all. Those missing ladies on the festival, which I therefore haven't even been to, are fortunately on this compilation. Though it is just a side effect that you find old mates and new nuggets on these stunningly musical compilations, FemaleFuture Transatlantic refers to an important factor: it's not the make-up of electronic music, featured just by females, that is misleadingly seen by the press as its curiosity! But rather the fact that almost all other releases are men-dominated, without being earmarked as such, though. Hence: welcome back to normal. 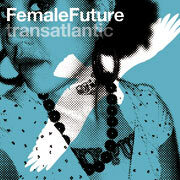 FemaleFuture Transatlantic itself is far more than just a compilation. Its objective is to feature those annoyingly understaffed women, arising from the (in the broadest sense) electronic music scene, though there are initiatives and labels like Female Pressure or Women On Wax. And by doing so, they aim to present thrilling producers and their tracks to an interested audience. The compitation does even walk further off the beaten track by trying to link translocal, generation spanned, and genre-tanscending relations amongst the artists on both sides of the atlantic. Like the English cultural scientist Paul Gilroy describes it as a historic process of a consecutive and cross-community exchange in his disquisition on the constituency of 'black identity', FemaleFuture Transatlantic leads a musical, forward-turned discourse with all represented women. Not only the tracks, but also the sampler itself is the realised dictum of Niobe, producer of a stylistically undefinable sound from Cologne, is to say that: nothing is ventured out, because of constant fear from practicability. But with Niobe it's different, since there are no dispensable limits: coming up with the classy jazz-voice of Niobe, tinkering with technique, she is followed by the big surprise of the record, the 70 years old Alice Coltrane, a pioneer of the jazz-harp and widow of John Coltrane. Her hinduistic aspirated debauch is dancing cheek to cheek with the chirping synthesised cello of Michaela Melián, a starlet of the fine arts, too. Just mentioning the first three tracks of a compilation, which is moving zigzag over the atlantic and is no knee-jerk at all. It's a spanning get-together from melancholic pop soundtronics, by Barbara Morgenstern and Masha Qrella from Berlin, to the deep Detroit-Techno-Connection, by Moodymann-collaborationist Sky, DJ Genesis or remixer Minx. Thus Karlsruhe, Germany, is interacting with Oxford, U.S., and fine lines are drawn between the cities, genres, and generations which might not be visible with the naked eye. Thanks to FemaleFuture Transatlantic we can see - and especially hear: great music which is, seen in this context, actually visionary".